With five generations in the workplace (more than ever before) a lot of recent research has presented a climate characterized by tension and misunderstanding. 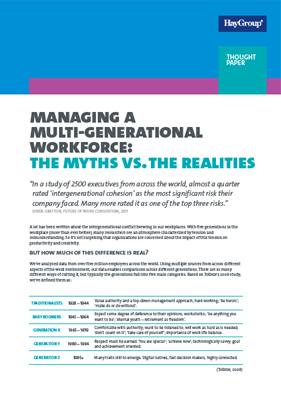 But are there really significant differences between the expectations and needs of different generations at work? Our data, perhaps surprisingly, suggests not. © 2015 Hay Group. All rights reserved.